It's one of the most bizarre concepts for a computer we have ever seen, and since it was announced back in CES 2009, TechRadar has been scratching its collective head whenever the Asus Eee PC Keytboard is mentioned. But now the device looks to be getting a release, you can't help but fall in love with it. For the uninitiated, the device is essentially an Eee PC stuffed into a keyboard (hence the Ronseal-esque name), complete with a 5-inch (800×480 resolution) multi-touch display. Asus has gone back to the drawing board with the keyboard, offering up an easier to use user interface. This means that most applications are one or two touches away, so there's no getting lost in myriad menus. Powering the keyboard is an Intel Atom N270 and the device comes with 1GB of RAM and either 16GB or 32GB of solid state storage. Asus doesn't expect you to use it just on its own, although as there is a screen the option is there. Through something called Eee WiCast wireless HDMI, you can hook the keyboard up to a monitor and stream HD (720p) media to the screen – as long as you are about five metres away. 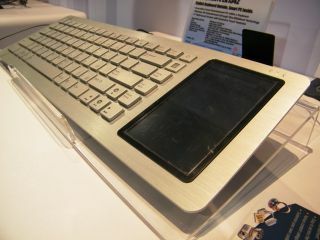 Asus told TechRadar that it is under no illusions that the Eee PC Keyboard will become iPod like in popularity. It knows it's a niche product and it's being treated as such. The Asus Eee PC Keyboard is out in the US in February for $499. Expect it to wing its way to the UK in Q2.